First of all, we thank all organizations, corporations, businesses, and members who have supported our efforts over the years. Special thanks to all employers who have supported their CFE and member representatives of our organization. 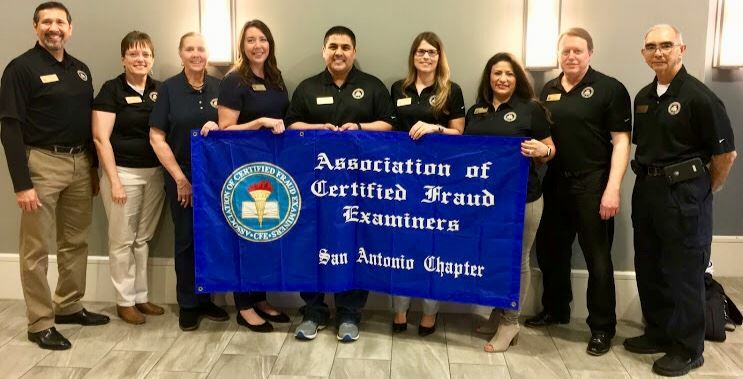 The San Antonio Chapter #18 is a non-profit organization dedicated to education and community outreach related to prevention, deterrence, and detection of fraud. Our Chapter was registered with the Association of Certified Fraud Examiners in 1990. The Chapter's founder is unknown but the names of John Webber, Jim Peters, Bert Marshall, and Ted McFadin are remembered as one of the first members, founders, and Presidents. Past President's include Ray Espitia (2000-2006), Joe Curiel (2006-2013), and current President Wende Preston. In 1990 the minimum amount of members required to start a Chapter was ten. Today, we have over 120 names associated with this chapter. Our Board of Directors is comprised of ten highly respected professionals in their respective fields who volunteer their limited time to the planning and management of the Chapter. Their continuous efforts and support, to include those of the entire membership, has contributed to the success of our organization. We are fortunate to have a diversity of expertise and experience within our Chapter. Our membership is comprised of Certified Public Accountants, retired and active federal, state, and local law enforcement, Financial Institution Fraud Investigators, Criminal Investigators, Loss Prevention Managers, Private Investigators, Insurance Investigators, Securities Fraud Investigators, State, City, and School District Auditors, Assistant District Attorney's, Non-profit Organization Investigators, Risk Managers, Military Criminal Investigators, and students. Our goal is to continue our mission in fraud education and community outreach. We strive to take our organization to the highest level, being the best ACFE Chapter in the World. We encourage you to consider joining our organization and becoming a Certified Fraud Examiner. Your ACFE credentials are highly recognized throughout the world and provides credibility in fraud examinations and investigations. For information on how to join, visit the Membership page.